White is always on trend, and it matches with everything--making it the perfect color for a vanity! We researched some of the best-selling vanities around to put together our white makeup vanity review. From sleek and modern to vintage-look options, we’ve got you covered! But first, check out these features to consider when shopping around for a new vanity. Drawers - The number of drawers affects how much storage space you have and how you can organize your products. Organizer - Some vanities also feature storage pieces on top of the table that can help keep products within easy reach. Movable Mirror - Mirrors that tilt or fold can help you check out your look from every angle to ensure a perfect finish every time. Mirror Size - A small mirror may work well for up-close details, but you may prefer a bigger one for hair styling. Material - Common materials like particle board and MDF can be inexpensive, but wood is often a more durable option. Dimensions - Dimensions are important, not just because stock photos can be deceiving, but also to find the best fit for your space! Ready to find out more about the best white makeup vanities? Check out our top pick and budget pick if you’re in a rush, but there’s a ton of variety out there that we tried to cover with our additional product reviews. No more leaning over the bathroom sink to do your makeup--it’s time for a change! Our top pick stands out from the rest by being made entirely from wood. This ensures a sturdy, high-quality base without MDF or particle board. Five drawers provide a good amount of storage space for everything from makeup to perfume and hair accessories. The tri fold mirror features a central panel measuring 17’’ wide and 24’’ high, framed by two mirrors attached with hinges that measure 7.5’’ wide. The side mirrors can be adjusted so you can see every angle of your look. A matching stool with a light beige fabric cushion is included. This white vanity keeps it simple, so it can blend easily with a wide range of decor styles and furniture. The 19’’ by 43’’ tabletop offers a lot of space for setting up your supplies and arranging displays of jewelry and other items as needed. The all-wood material makes this a great choice for the long haul! Keep it simple with this small vanity with included a matching bench from Frenchi Home Furnishing! The rounded legs in the cabriole style and elegant silver drawer handle provide a hint of vintage elegance to this simple vanity. The single drawer doesn’t provide a ton of storage space, so this piece would work best for those with small makeup collections or for storing products elsewhere. The mirror, measuring about 10’’ wide by 15’’ tall, can be swiveled back and forth to different angles depending on the task at hand. The compact size of this vanity makes it a great choice for small spaces. The included bench features a light tan fabric cushion. You can slide the bench under the vanity to keep your area looking clean and uncluttered while maximizing floor space. This vanity would work well for dorm rooms, studio apartments, and small homes where space is limited. This simple vanity from Songmics comes with a trifold mirror and a cushioned stool, plus vintage-look ring pull handles for an eye-catching accent. The five drawers provide an above-average level of storage capacity for a variety of different cosmetics, hair products, and more. The center mirror measures 17.1’’ wide and 25.5’’ tall with two accent mirrors 7.8’’ wide by 20.1’’ tall on hinges. This mirror piece can be removed if you want to use the vanity as a desk or work area. Braided accent molding around the drawers and sides give this vanity a little character. The 42.8’’ by 18.8’’ tabletop gives you a lot of space to work with if you want to set up your own organizers on top! You also get a matching stool with a pale gray fabric cushion. Non-slip pads on the ends of the vanity legs help to protect flooring from accidental scratches and scuffs. Does your dream vanity have all-white everything? 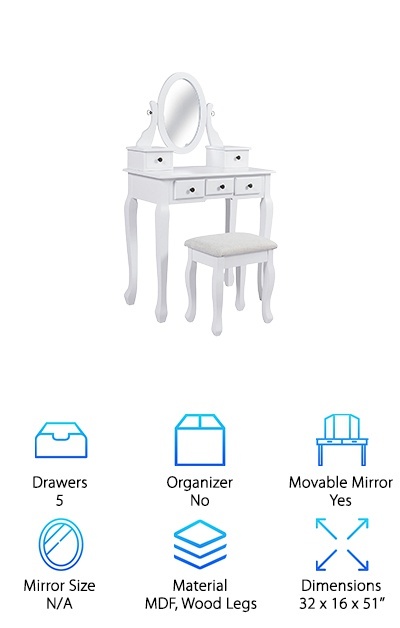 This mirrored makeup vanity from Giantex pairs feminine floral accents with a sleek and modern all-white finish. It’s pretty much guaranteed to match with everything! Two drawers are set under the table, while an organizer with two small drawers, a cubby space, and a narrow shelf form the base under the mirror. The mirror (measuring 15’’ wide and 21.6’’ tall) swivels back and forth to help you find the perfect angle for different tasks. 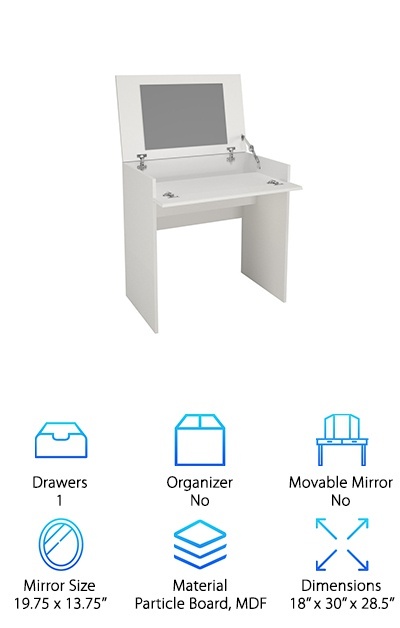 It has an average amount of storage space with some handy organization options thanks to the mini drawer setup below the mirror. The white floral handles add a cute feminine touch. A matching stool is included, too. The 29.5’’ by 15.7’’ tabletop provides a good amount of space for you to do your beauty routine, plus a little extra for displaying jewelry or other items--all at a great price! The Tribesigns French Vintage-Look Vanity brings classic French elegance into your bedroom or bathroom in a gorgeous ivory white piece with a tri-fold mirror. 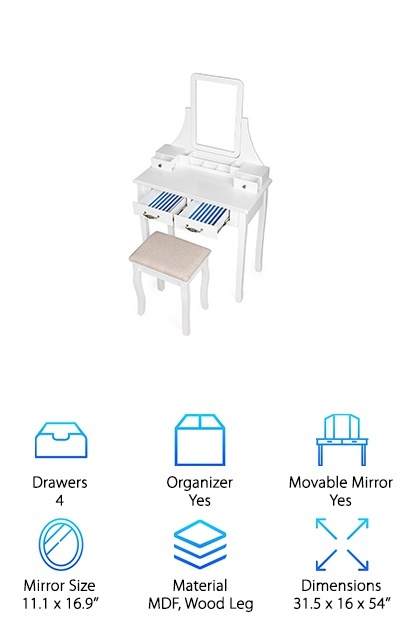 Storage space is provided by three drawers under the tabletop, plus a base organizer piece attached to the mirror with two small drawers and an open cubby. The central mirror measures 13’’ wide by 19.3’’ high, while the side mirrors measure 5’’ wide by 15’’ high. Molded floral accent designs with vintage-look handles and knobs give this vanity some gorgeous vintage character and a feminine aesthetic. The tabletop measures 17.3’’ by 39.76’’, giving you plenty of space to work. 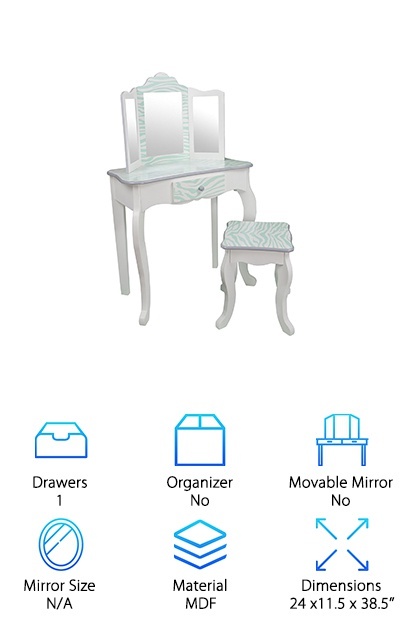 The mirror and organizer piece isn’t nailed down to the table, so you can move it away if you need to use the table for working or writing. A matching stool is included with a silver and white patterned fabric cushion. If you want a chic vintage vanity for makeup, look no further! The Best Choice Bathroom Vanity has a good amount of storage space with five drawers, with three in a row under the tabletop and two set on top on either side of the mirror. The oval mirror swivels back and forth so you can adjust it for different tasks like applying mascara. An included matching stool has a padded gray-white seat. The tabletop measures 30’’ by 16’’, giving you a sizeable work area with space to keep brushes and other tools. The multiple small drawers make it easy to organize makeup, skin, and hair products, so you don’t have to dig around to find what you need. People looking for an average level of storage space should have good results with this vanity. It has a simple design that should blend well with just about any decor style, plus a great price that’s hard to beat! The Nexera Blvd Vanity is an ultra-modern piece that lets you hide away your products for a clean and neat look that doubles as a desk. If you want a multi-function makeup vanity with storage space, this Nexera piece opens up to reveal a main work and storage area with a recessed area below the mirror that works well for taller bottles or storing brushes upright. The mirror is attached to the top panel and measures 19.75’’ wide and 13.75’’ high. Once you close the top panel and a front panel, this piece becomes a tidy writing desk or work space. Adjustable levelers help you stabilize your work area for uneven flooring or carpet. If you would rather conceal your cosmetics and other products entirely for a totally clean appearance, this double-duty vanity piece might work perfectly for you! A stool is not included with this product, so you can choose your own chair to match. Songmics offers a simple vanity with high-quality finishing touches that are hard to resist! Two large drawers under the tabletop move smoothly on sliding rails, while two small drawers on either side of the mirror are felted on the top and bottom for quiet movement in and out. The mirror measures 11.1’’ by 16.9’’ and can be rotated up to 360 degrees. 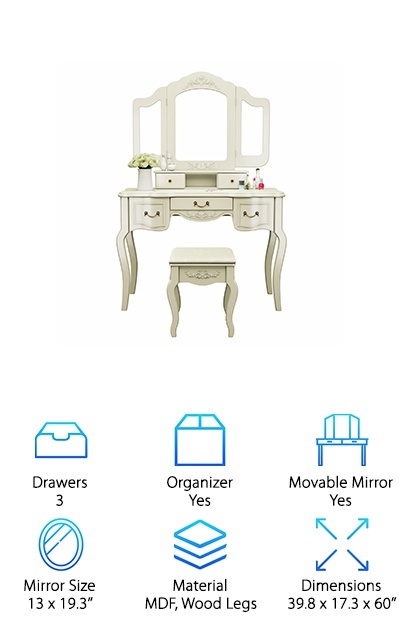 The vanity also comes with an optional cosmetics organizer that can be placed between the two top drawers in front of the mirror. This gives you a way to neatly display eyeliner, brushes, foundation, and more within easy reach. The vintage-look knobs and lattice cutout handles give this relatively cheap makeup vanity a high-end look! 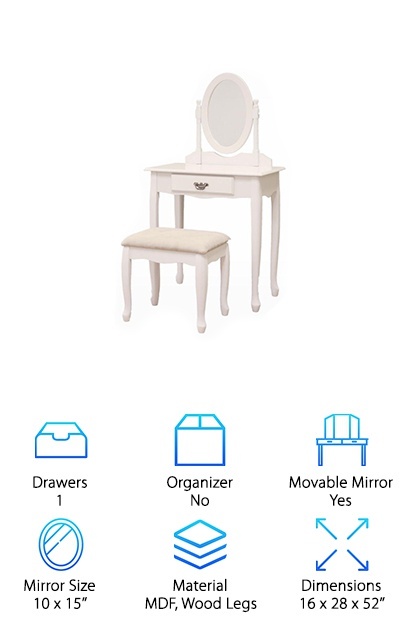 The vanity comes with a matching square stool with a light beige cushion. Rather than rounded edges, this design has more straight lines for a simple and modern look. 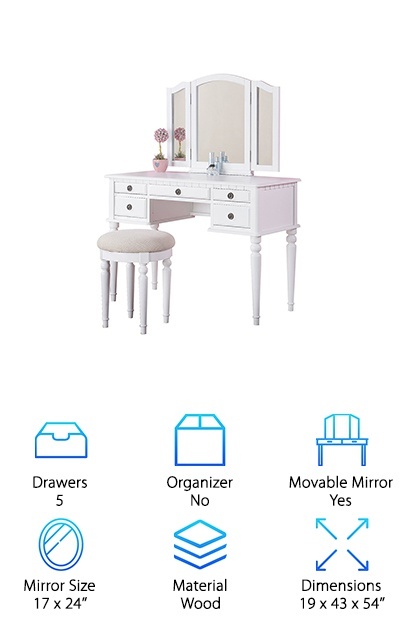 This white makeup vanity comes with five drawers for organized storage and a tri-fold mirror to help you check out your look from every angle. The central mirror is 17’’ wide and 25’’ high, while the side mirrors are 7.8’’ wide. The side mirrors are on hinges for easy adjustment. The vanity also comes with a matching cushioned stool with a white base and a light beige cushion that matches easily with any decor. Round pull rings on the drawers with a dark brass finish provide a unique accent while keeping the vanity’s profile sleek. The 42.5’’ by 19’’ table provides plenty of room for displaying jewelry, brushes, or your favorite eyeshadow palettes. If you’re looking for an inexpensive vanity that will fit right in with your bathroom or bedroom, this choice from Giantex should work well! It’s ideal for people who need average to minimal storage space for their products. 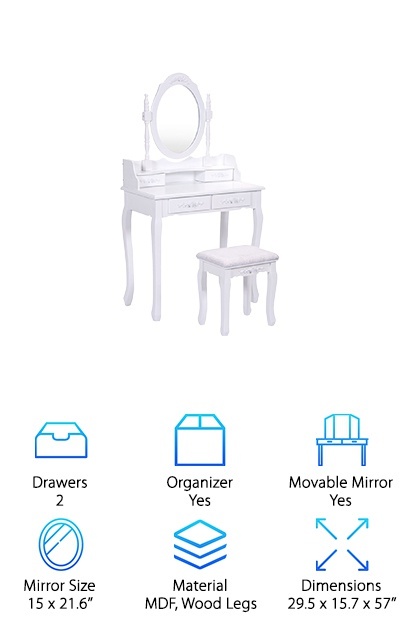 If your little one has taken an interest in makeup and beauty, the Teamson Kids Vanity Table is a great way to let them experiment without digging into your stuff to do it! The table features a central mirror with two smaller angled mirrors on either side to get a full view from every side. A single drawer provides storage for brushes and makeup sets. 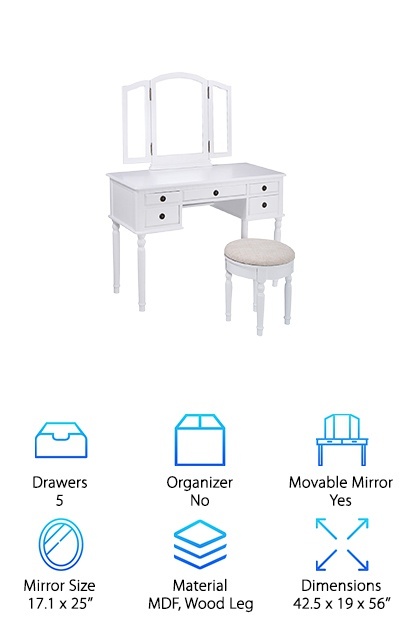 This vanity for kids comes in a variety of accent colors on a white or black MDF frame painted with lead-free paints. 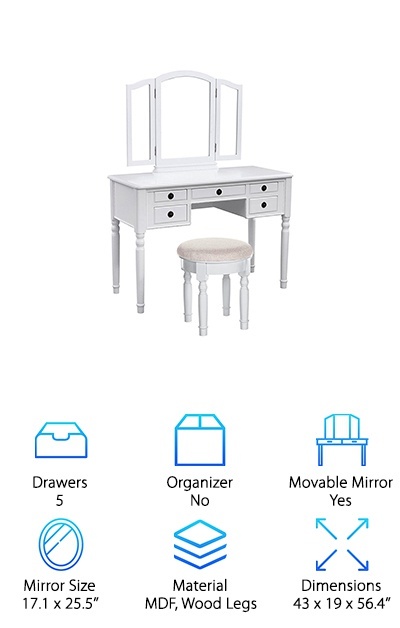 Kids three and up will love this children’s makeup vanity and the included stool! The table is 23’’ high and the chair is 13.5’’ high, so it’s definitely child-sized! Choose from fun animal prints in colors like pink, purple, and blue. It takes about 30 minutes to assemble and provides hours of play time!